Its been officially spring for 2 months and 10 days. Spring means lots of things but one of the things I most look forward to is Gardening. This year in my garden I FINALLY have rhubarb to harvest and was able to pick some for the first time this week! 3. 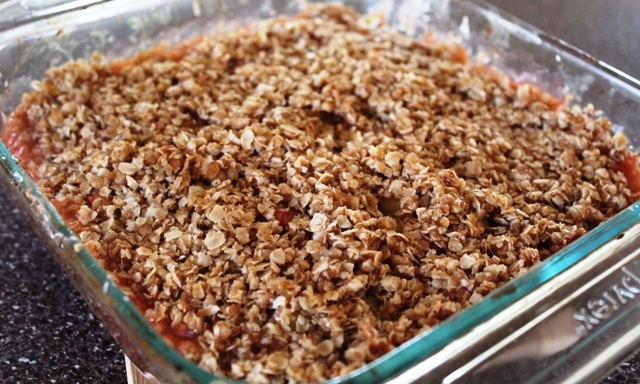 In a medium bowl, stir together rolled oats, brown sugar and melted butter. Mix together until completely combined. 4. Bake for 40-45 minutes in the preheated oven, until rhubarb is tender and the topping is toasted. I think this is best served warm with vanilla ice cream. If you are going for the low-sugar theme serve with low-sugar ice cream, which is really good and my hubby doesn’t even know its low sugar. I love rhubarb, so check back for some more delicious rhubarb recipes this summer! Do you have a favorite recipe you would like to share?